The most important things in Simon Murray’s life are football, friends, and film—in that order. His friends despair of him ever meeting someone, but despite his loneliness, Simon is cautious about looking for more. Then his best friends drag him to a party, where he barges into a football conversation and ends up defending the honour of star forward Declan Tyler—unaware that the athlete is present. In that first awkward meeting, neither man has any idea they will change each other's lives forever. Like his entire family, Simon revels in living in Melbourne, the home of Australian Rules football and mecca for serious fans. There, players are treated like gods—until they do something to fall out of public favour. This year, the public is taking Declan to task for suffering injuries outside his control, so Simon's support is a bright spot. But as Simon and Declan fumble toward a relationship, keeping Declan's homosexuality a secret from well-meaning friends and an increasingly suspicious media becomes difficult. Nothing can stay hidden forever. Soon Declan will have to choose between the career he loves and the man he wants, and Simon has never been known to make things easy—for himself or for others. First Edition published by Dreamspinner Press, 2009. 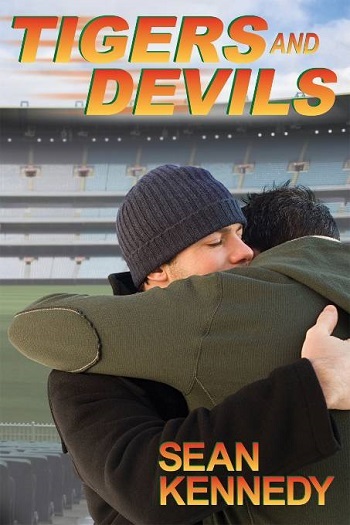 Tigers and Devils was unexpectedly humorous, in a way that wasn't over-the-top or forced. As I'm someone who isn't a fan of slapstick comedy, the sarcastic air left me grinning and chuckling. Instead of rehashing what is in the blurb, the who, what, why, I'll give my impression on the story. At nearly 400 pages, the book read much longer. I read an upwards of 1000 pages a day, and Tigers and Devils took me 3 days of nonstop reading. The pacing is slow, the way it is written is a bit jarring and all over the place. It's a storytelling type writing style, not necessarily in a fluid, linear timeline, like going back and showing a scene mentioned partially, before returning to the present. There was also a ton of everyday, inane short scenes that do not propel the story forward toward its conclusion. Redundancy. All that aside, I truly enjoyed Simon and his besties, Fran and Roger, as well as the rest of the side characters. They added a ton of levity. The stress and conflict caused by newfound celebrity felt authentic, as well as frustrating, adding a ton of angst. This is definitely a book about miscommunication, running away, and being a coward. I sided with Simon, feeling as if it wasn't his fault, and got fed up with the immature running away attitude. At the climax, I didn't feel the communication necessary was shown, and know in real life, this relationship would be doomed, as his partner is not mature enough to be in a relationship. I was sick of everyone blaming Simon while catering to the wounded, woe-is-me runner. You can't grow up when coddled. I'm curious to see where this series goes next, but am happy with this couple's conclusion, and I hope the next book is a new couple. With such a meandering book, I don't think I could keep interested if I read more from them, to be honest. SEAN KENNEDY lives in Perth, Western Australia, but his heart still belongs to his hometown Melbourne—which is also the home of Simon Murray and Declan Tyler from his series Tigers and Devils. A disciple of cult leader David Lynch, Sean is breathlessly awaiting the revival of Twin Peaks in 2016. Reviewers on the Wicked Reads Review Team were provided a free copy of Tigers and Devils (Tigers and Devils #1) by Sean Kennedy to read and review.